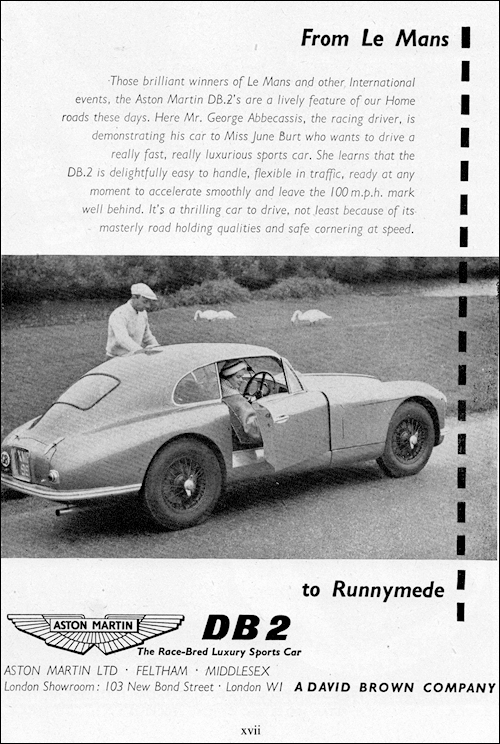 DB2 models from October 1951 are distinguishable by the one-piece radiator and brake duct grille. Two piece windscreen is replaced by single piece curved one. 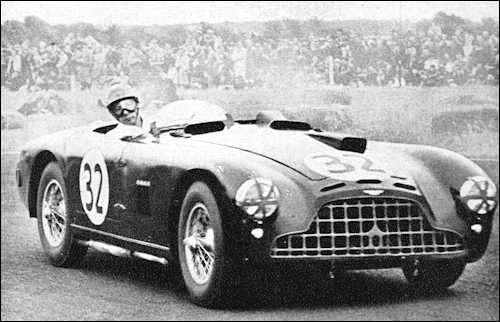 George Abecassis at the wheel of a 2.6-litre DB Aston-Martin going through one of the long curves at Boreham. 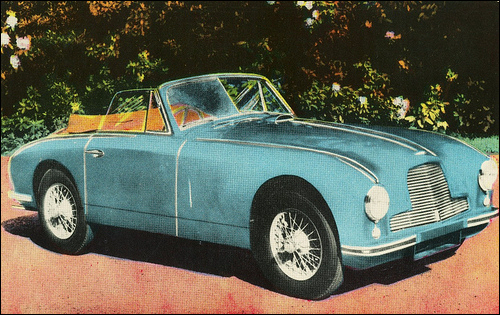 Aston Martin DB3 Sports Roadster is a limited-production model, sold primarily for competition work and powered by a six-cylinder 2580-cc (2922-cc from late 1952) double-OHV engine driving through a five-speed gearbox coupled to a DeDion type rear axle. A factory-entered DB3 won the Nine-hour Race at Goodwood in 1952 -the model's first major victory. 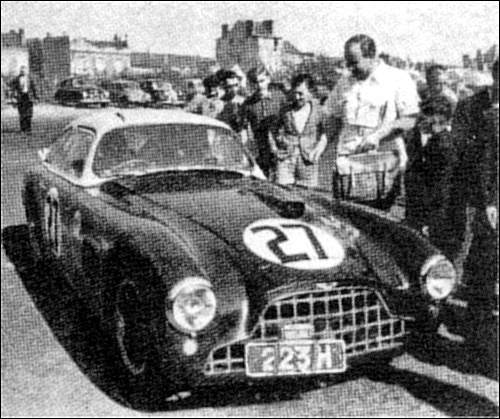 In 1952 a privately-owned DB2 came third in the Le Mans 3-litre class and seventh overall. 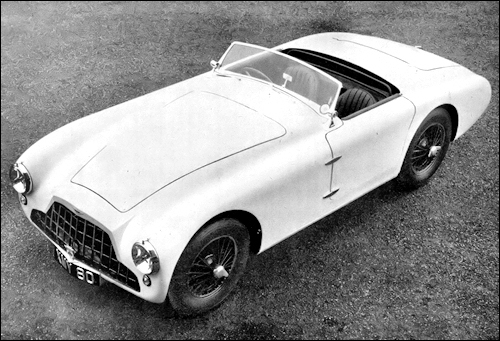 The prototype DB III Aston Martin made its debut in the 1951 T.T. 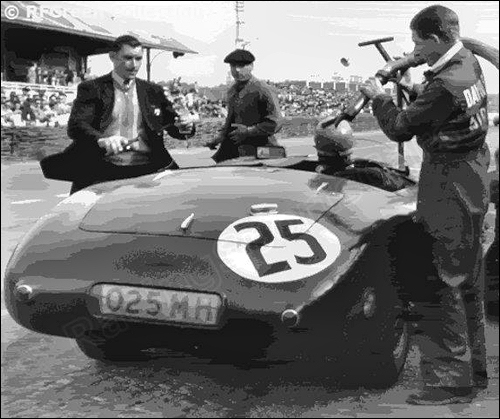 race, and when it had to retire by reason of a minor defect it had been in second position for some time. A team was run by the factory during 1952 and the last important sports-car race of the year (the Nine-hour Race at Goodwood) also brought the model its first major victory. A limited batch is under construction for sale to owners who wish to take part in competitions. 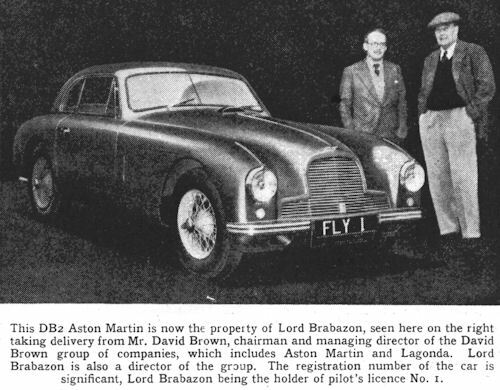 These cars may be considered the first to be wholly designed by the existing Aston Martin management. 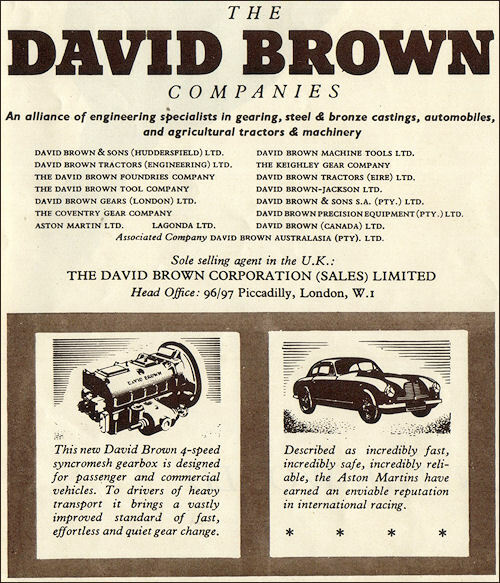 The DB I and DB II were wholly in the first case, and partially in the second, derived, so far as engine and chassis were concerned, from earlier products. With certain changes (which will be itemized later) such a statement remains true so far as the engine of the DB III is concerned, but the chassis thereof is an entirely new concept which has come from the drawing board of Prof. Dr. Ing. Eberan von Eberhorst, and has been thoroughly tested and developed under the supervision of John Wyer. As just stated, the changes which have been made in the engine are of comparatively minor moment, the most obvious external modification being the use of three double-choke downdraught Weber carburettors Type 36 DCFS. Each of these feeds into a separate inlet pipe and port, and arrangement which has not only given a worthwhile improvement in maximum power but has also substantially increased the torque in the lower part of the speed range and thus improved the acceleration figures. A new timing cover enclosing the chain drive to the two overhead camshafts permits a lower bonnet line than heretofore and the front engine mountings have also been slightly changed. A further immediately visible difference is the use of a ribbed sump in magnesium alloy giving a greater oil capacity, the lubricant being fed through an oil radiator which is built in with the water radiator and has one-fifth of the total area exposed. Internally, the oil is supplied under pressure through the Tocco hardened crankshaft to the four main, and six big-end, bearings, all of which are made by Glacier from steel strip coated with copper lead. The radiator itself is very lowly placed, necessitating a separate header tank, and is maintained at a constant pressure of 1.27 ata corresponding with a water boiling point of 110° C.
Torque is transmitted through an orthodox single-plate Borg and Beck clutch to a David Brown five-speed gearbox. The box is split along the centre line and with shafts placed at 2¾-in. centres it is extremely creditable that neither size nor weight exceed the figures appropriate to the existing four-speed box. The new design embodies the Borg Warner type of baulk ring synchromesh on the upper four ratios and a gear-type oil pump is driven off the lay-shaft and feeds oil constantly to the freerunning pinions. The division of the light alloy casing into two parts makes it possible easily to provide a centre bearing for the shafts and the gear lever is mounted on a slight backwards extension with very small space intervals between the required positions for the various gears. The propeller shaft is conventional in being a one-piece tube with two Hardy Spicer joints; unconventional in that it runs in a fixed plane and drives a bevel box fixed to the frame. This is of Salisbury design in which the hypoid bevel gear is enclosed by a malleable iron casting and the drive is taken through a conventional two-pinion differential. The two half-shafts are exposed and each carries a Hardy Spicer joint with 3¼ in. between centres. The rear brakes are disposed inboard and immediately adjacent to the bevel box, the drums themselves being of Al-fin construction (i.e. light alloy drums with inserted ferrous liners chemically bonded to them by the process operated in this country by Wellworthy), and the back plates are aluminium alloy pressings. Scoops in the undershield direct air currents both on to the rim and on to the face of each brake drum and expert opinion has testified that despite apparent enclosure of brakes in this position it is actually easier to cool them than when they are placed on the hub but partly shrouded by the rim of the wheel. Each rear wheel on the DB III is supported on a steel hub into which is welded a steel de Dion tube which is itself made in three sections welded into one. The wheels and the de Dion assembly are located sideways by a Panhard rod and positioned by parallel links on each side of the car which connect with the suspension elements and also act as torque members. These links, which are rubber-bushed, are symmetrical so far as the upper elements of each pair are concerned but the gap between the pair on the nearside of the car is greater than that on the offside. By this means each lower link can engage by serrations with a transverse torsion bar, one mounted above the other and running within a frame cross member. Each bar, which is supplied by English Steel Corporation, is pre-stressed and shot-peened and is 36.4 in. long (effective) and 0.864 in. diameter, and a movement of 4 in. is permitted between the neutral laden position of the wheels and full bump and 3 in. rebound. The total weight of the unsprung elements of the rear axle is 1622 lb. Damping is provided by Armstrong double-piston-type dampers which also provide the pivot bearing for the upper arm. The Rudge Whitworth knock-off type wheels pivot on ball joints and are steered from a rack and pinion. The front brakes, the drums of which are also of Al-fin type, embody two leading shoes and magnesium back plates and the total mass of the front unsprung elements is 1021b. Variation between front and rear braking can be quickly effected by altering the setting of the whiffle-tree which is interposed between the pedal and the two Girling master cylinders, but the normal proportion gives 65 per cent. on the front wheels. The compact open two-seater body has a frontal area of 13 sq. ft. This compares with 18 sq. ft. on the DB II saloon and although the latter body has an exceptionally low coefficient of penetration it will be seen that the total drag of the open car will not exceed that of the closed model unless the Cw factor is increased by more than 38 per cent. Assuming that there is parity in total drag, the open car scores not only from any intangible benefit that it may give to the driver, but from the very low total weight of 189 lb. The cars supplied to the public are provided with a really-weatherproof hood and a luggage locker of exceptional capacity for this class of car.